It is so popular that it’s not only made routinely as a family meal, it has also been chosen as the aash to mark more than one special occasion. One would spend a whole day preparing, cooking and distributing aash-e reshteh to ‘send-off’ a family member on a long or important trip. 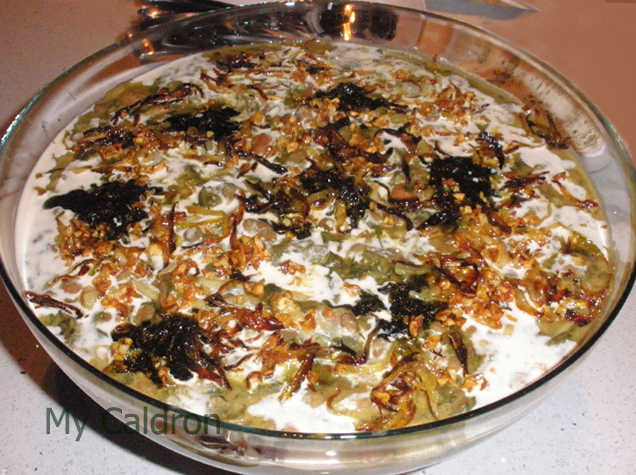 Traditionally, aash-e reshteh is also made and served at a chaharshanbeh soori get-together–the festivity held on the eve of the last Wednesday before the Persian New Year. Nowadays, many Iranian cities have seen aash-e reshteh travel from the home to the street corner, joining the long list of popular street foods served through window slots in disposable bowls. Before getting on with ingredients and one method of cooking it, let me briefly introduce some significant aspects of this aash: First, aash-e reshteh is made without meat—a detail that makes its popularity a bit of a mystery in a culinary tradition that values meat so highly. Secondly, aash-e reshteh contains two purely Iranian food products, reshteh and kashk, both of which may be found in Iranian (and some Middle Eastern) stores. A. Reshteh is a noodle made from wheat flour. This flour is first mixed with water and made into a paste, then cut into thin, flat strips and sundried. No cooking is involved. 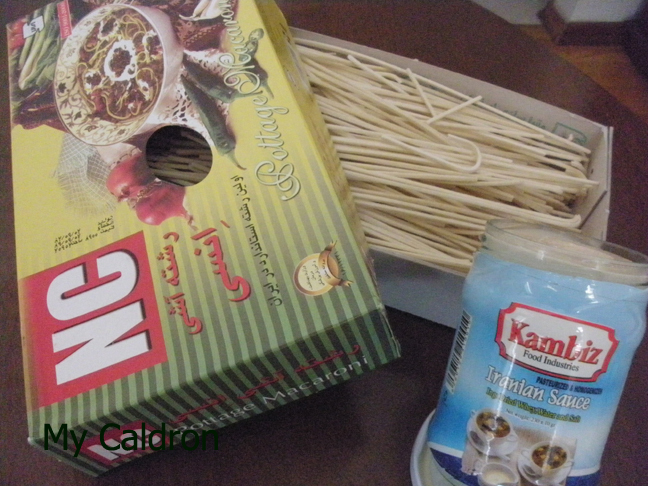 Once completely dry, these unique-tasting noodles are transformed into fragile, whitish strips with rectangular cross sections to be used in a few other Iranian dishes besides aash. I have not seen reshteh anywhere outside of Iran except in Iranian stores; neither have I seen its name mentioned as a member of the noodle family in any culinary source. 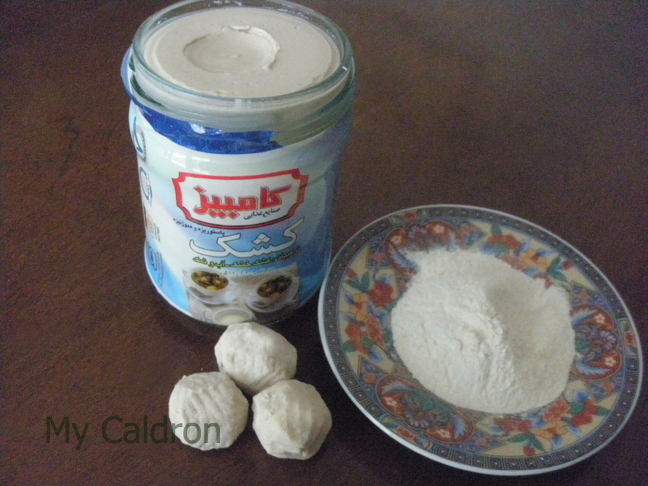 B. Kashk, often inaccurately translated as “whey,” has no real English equivalent and is generally unfamiliar to non-Iranians. The nomads in Iran used to make butter by beating yogurt in goatskins. Once the butter was separated, the residual liquid made a delicious dairy drink called doogh (a popular summer hit and favorite with rice and kebab). When doogh was dried and mixed with lots of salt, it became yet another dairy product called kashk that could be preserved for a long time as a nourishing source of protein, much welcome during times of food scarcity. Today, kashk is used in liquid form, either hot or cold, not only for aash-e reshteh but in many other Iranian foods and garnishes. It is also made into small, solid balls for a school children’s snack. kashk, hard liquid form, about two third the bottle shown in the picture or 150 gr. Chick-peas, black or red kidney beans, lentils one cup each. Fresh or frozen parsley and chive, half a bunch each. Spinach twice the amount. All herbs are chopped. Note: Spinach is the key green for this aash and could replace all of the other herbs and still make a decent-tasting aash-e reshteh. For garnish: Onion, 1 large, thinly sliced. Garlic, 6-7 cloves, Finley chopped. Dried, powdered mint, 1 tbsp. Method: Just as was the case with aab-goosht, it is a good idea to soak chick-peas and black or red kidney beans overnight in separate bowls (lentil does not need soaking). Soaking helps speed up the cooking process; more importantly, it diminishes the troublesome consequences of eating gas-producing beans. If soaking is not a possibility, bring the water to a boil and discard at least once before letting the beans cook. It would do the same trick. Discard the water and using fresh water and a pinch of salt boil all three beans in separate pots as they have different cooking times. Cook them well since undercooking is another factor in giving you gas. – While the beans are being cooked, get started with your fried onions or piaz-daagh: in a big pot warm up one tbsp of oil and stir-fry one of sliced onions until translucent. (Set aside the other onion—we will be using that for a garnish.) Once the onions are nearly done, add three cloves of peeled, chopped garlic. Stir-fry the mix for a minute or two, add turmeric and black pepper and fry some more. The base of your aash is ready. – Add the chopped herbs to the pot along with the well-cooked (but not too soft) beans and whatever water is left in their pots. A part of the salt you need for your aash is provided by the beans, and the kashk will also add its own salt, so it’s best to adjust according to taste closer to the end of the cooking process. Add a couple of glasses of hot water if you did not get much extra water from the beans’ pots and cook over medium heat for about one hour. Peek into the pot several times to stir gently. – Once the aash looks well melded and harmonious, you can add your Iranian noodles, reshteh, to the surface of your pot, one by one. Try not to break them, and avoid crowding them in the pot as they will stick together if mounted on top of each other. By now, you should have just enough water in your pot for the noodles to absorb, but not much more. Once the noodles are added, reduce the heat to low and do not stir. In five to ten minutes the oozing aash is ready to be garnished and served. Some cooks dissolve two or three tablespoons of kashk in hot water and add it to the aash at this stage, while others use kashk only on top of the serving bowl. It really depends on how big a fan of kashk one is, and how much of it one would like to have in the aash. Aash reshteh should defiantly be served hot. So, prepare garnishing material in advance and once it is ready, just pour it in a nice bowl, garnish and take to the table.